I say “our” first show instead of “my” first show very deliberately. 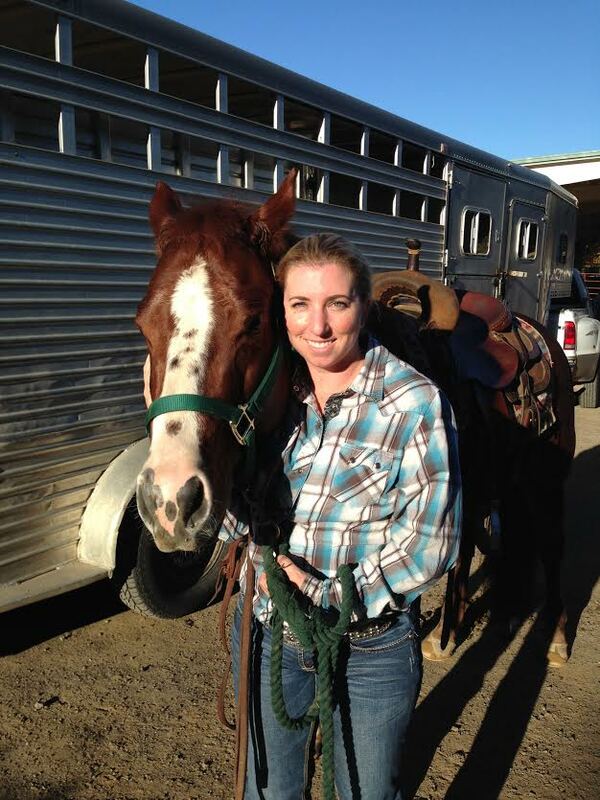 I could do none of this without my horse. Sometimes I take a step back to think about how amazing this sport is – an animal that weighs ten times what I do allows me to climb on his back, poke him in the ribs, and make him run when he would otherwise rather be grazing. He has the opportunity to kill me at any moment, yet he doesn’t. Our show was a couple of weeks ago and I honestly could not have asked for it to go any better. It was a schooling show, so the idea is that people and horses of all different ability levels can compete in a safe, non-stressful environment. Everyone is there to work on something and have the experience of a show without some of the pressure. The first chunk of the morning we spent getting ready – the horses needed to be brushed and cleaned up, as well as tack. Then I had to get dressed and get my number pinned on. There was a lot of waiting around, which was awesome for Sue. He (and I) had to practice sitting, watching other horses, and just generally being calm. The same thing happened in the warm up pen – tons of other horses doing their thing and we had to practice just doing ours. We competed in three classes. 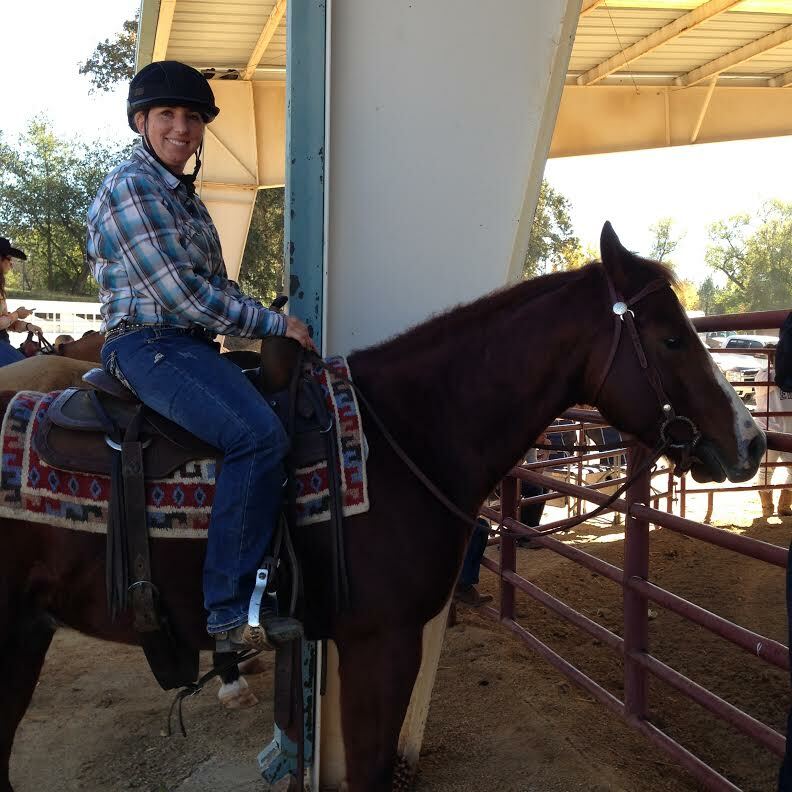 The first was a walk/jog class – the horse and rider are judged on how nice their gait is, how well they work together, etc. We had a really good time doing that and it was nice because there were 16 other horses in the class, so it wasn’t a solo thing right off the bat. The second class was our pattern – you have to move the horse through a series of walking, backing, loping, jogging, trotting, and galloping. Sue was amazing… he did absolutely everything I asked him! I missed the right lead (horse speak for making him run but starting with the right front hoof), which automatically disqualifies you. It was a great experience and was the one thing that went “wrong”. Needless to say, we’re going to keep working on that right lead! After that, we played around on the trail course – basically a series of obstacles that you and the horse have to navigate. Not once did Sue do anything bad (there were other riders there that had horses try to buck) and I could feel that he was really trying hard! I love that horse! The last stop on this year’s anniversary trip was New York, New York. Mike and I had both been there before (but not together), so we decided to try to visit places that neither of us had been to. 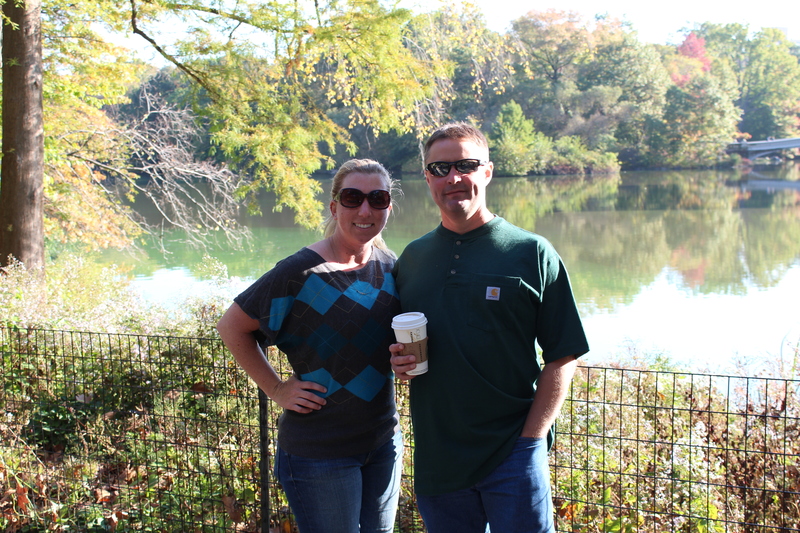 The first stop… Central Park. It was a beautiful morning and we spent a good part of the day walking around the park. It was gorgeous! They were setting up for the New York City Marathon, which was kind of neat to see. We headed over to Broadway that night to see “Phantom of the Opera”, my favorite musical. It was amazing… so cool to see a real Broadway show! Mike was ok with it… I think it got a little too operatic for him. Guess I’ll have to give up my dreams of him taking me to see the opera… I’ll have to stick with my classically trained friends! We also visited the Museum of Natural History, which I highly recommend. We slammed through it in a day, but easily could have spent much longer wandering the halls. We also headed out to see the 9/11 museum and memorial. The last (and only) time I was in New York was about four months after September 11th… it was a very different atmosphere. 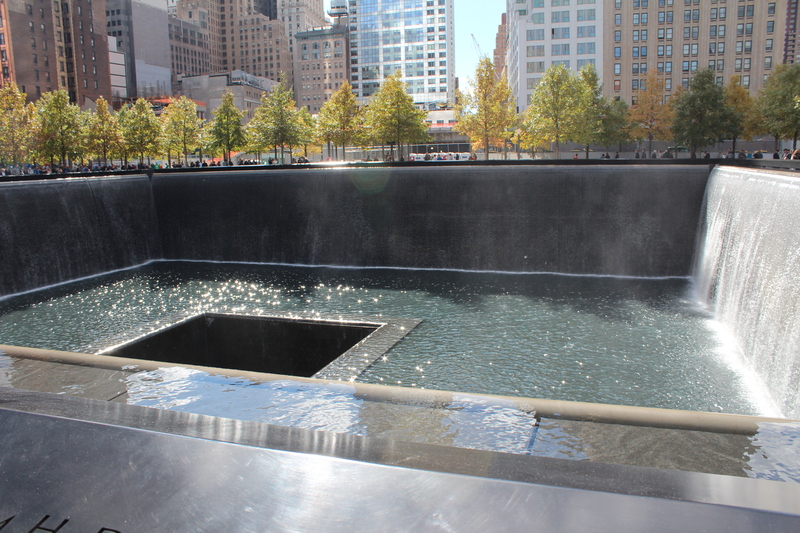 At that time, Ground Zero was still a pile… now it’s a very beautiful and respectful memorial. The footprints of the former twin towers are now infinity pools, with the names of the victims inscribed all around them. The museum was pretty neat too… I’m not sure what I was expecting, but I was expecting it to make me feel more emotional than I did. I think that’s mainly because seeing Ground Zero was such a moving experience and seeing it all in museum form felt more sterile. 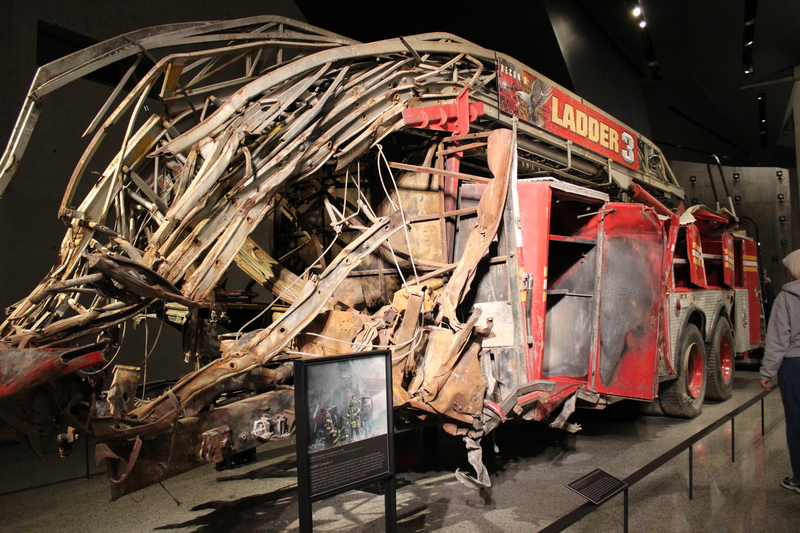 Seeing the Ladder 3 truck that was destroyed that morning was especially moving… having married a firefighter, I’m far more aware of the risks these brave men and women face each day. Mike’s uncle (a member of FDNY) was actually sent there from Brooklyn to help out that day. 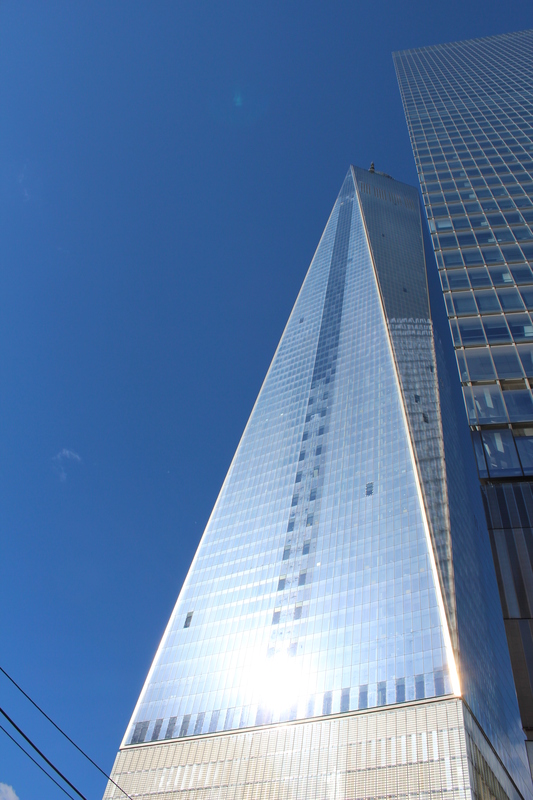 The new One World Trade Center is amazing… it makes you dizzy to look up at it! We finished our stay in New York by visiting Mike’s family on Staten Island. I honestly wish we would have had more time with them… we had a blast hanging out for a few hours on Sunday before everyone got ready for their work and school weeks! That, my friends, wraps up the 2014 Anniversary Road Trip! I’ll get all of my pictures posted to Facebook over the next day or so! We are now entering my favorite part of the trip. Before I get to Boston, let’s talk about the road there. We left New Hampshire first thing in the morning with the intent of driving straight into Salem. We took a little detour to Concord, Massachusetts – home of the first shot of the Revolutionary War (although neighboring town Lexington would argue that they’re the location). We stopped at the Old North Bridge, the place where the “shot heard round the world” was fired. It was a beautiful, peaceful place now, but like any historical battle site, definitely had the feeling of historical significance. We left there bound for Salem, which was a complete disappointment. I had been expecting something of historical significance there, but instead was met with cheesy museums and fortune tellers. We quickly departed Salem (seriously, we spent about 15 minutes total walking around) and beat feet for Boston. Let me being by saying we fell in love with Boston almost instantly. So much so that we decided to skip Nantucket and spend an extra day in Boston before heading to New York. If we ever had to move to the East Coast, Boston would be our city of choice. It had the big city feel, but the people were nice and vibe was very mellow. As luck would have it, Mike’s aunt was in town visiting, so we met up with her and her mother in law for drinks and dinner our first evening in town. 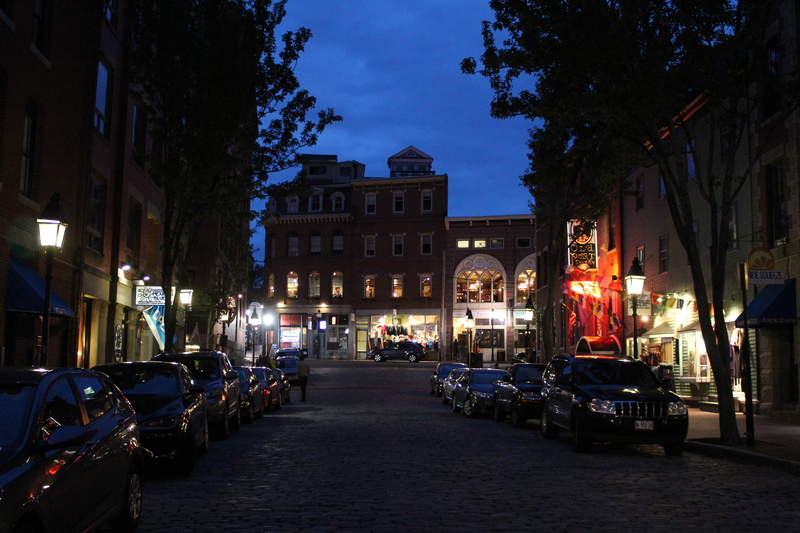 We stayed at the Marriott Custom House, which was absolutely amazing. Originally the building was used as the customs location in Boston (the bar is located in the “counting room”), a skyscraper was built on top in the early 1900’s, and Marriott purchased it in the late 1990’s. If you’re ever in Boston, this is THE place to stay. 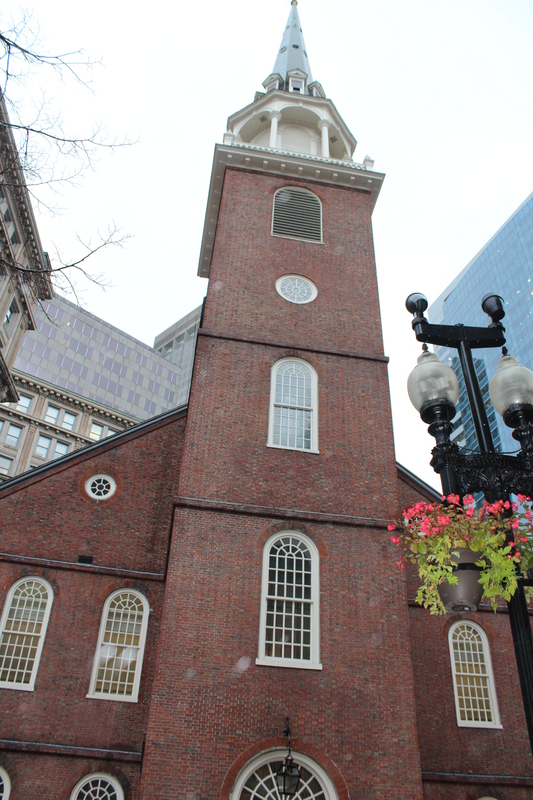 We spent day two in Boston following the Freedom Trail. It’s a two and a half mile walking path through the city (marked by a double brick line in the sidewalk) that takes you to Boston Common, Massachusetts State House, Park Street Church, Granary Burying Ground, King’s Chapel, King’s Chapel Burying Ground, Benjamin Franklin statue, Old Corner Bookstore, Old South Meeting House, Old State House, the site of the Boston Massacre, Faneuil Hall, Paul Revere’s house, Old North Church, Copp’s Hill Burying Ground, Bunker Hill Monument, and the USS Constitution. Yeah, a lot of places – a great way to see a ton of history without having to pay or stick with a tour group. In fact, we ended up doing about half of it in the morning, having lunch, taking a nap, and then heading out for the other half. We spent the morning of the third day visiting the Sam Adams Brewery, which was absolutely amazing. It’s a free tour and you get to drink a lot of beer. What better way to spend a rainy morning! After the tour, we took a nap (of course) and then headed out to see the Boston Marathon finish line. 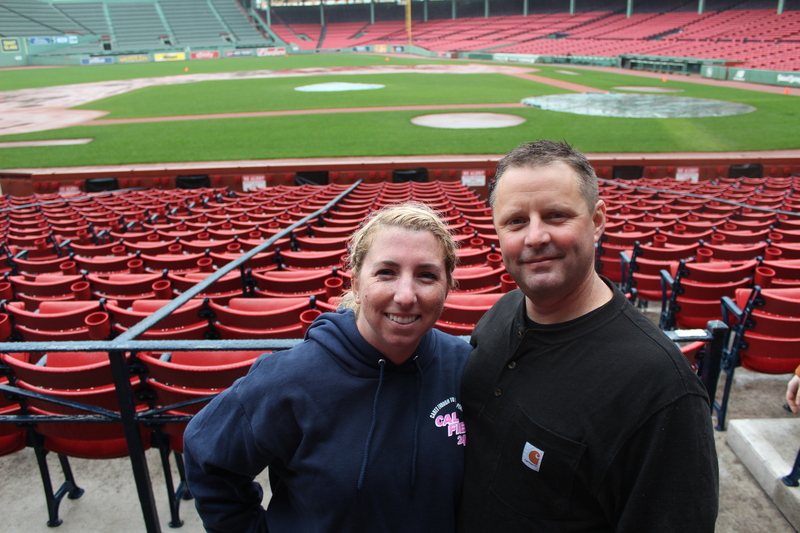 From there we headed to Fenway Park for a tour. Even if you’re not into baseball, this tour is amazing. They go over the history of the park and take you into places you’d never go if you just went to a game (the visitor’s locker room, press box). Seriously spectacular. Like I said, Boston is an amazing city. If you’re ever out that way, definitely stop in for a visit! I love that it shows both indoor and outdoor temperature and humidity, but I also love that it shows pressure. I sometimes get headaches when the weather changes and this will definitely be a help! 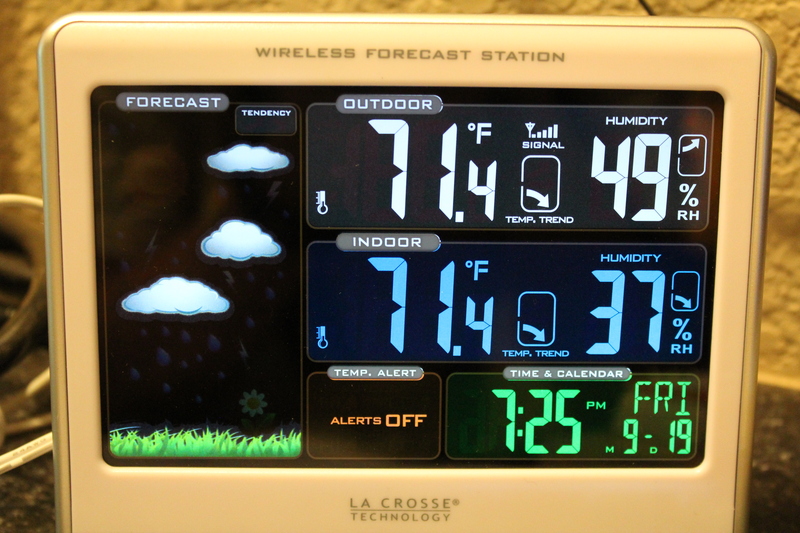 If you’re looking for something fun, colorful, and that works well (clearly this post is late as the date in the picture is September 19th), this is the weather station for you! This definitely goes into the love it category! I’ve been doing a ton of riding over the past few months and have decided to enter my first show! It will be on Sunday, November 9th and to be honest, I’m terrified. Sue and I have made great progress in our partnership, but we’re far from perfect. This show is a schooling show, so it’s meant for folks of my experience and ability. Those of you who know me know that I get competitive and super nervous… so even though there’s not anything on the line, I’d like to do well! This past weekend we practiced a lot… everything from going to a new arena (Sue’s thoughts: “scary”) to working an obstacle course (Sue’s thoughts: “cool!”). He really had a blast with the trail work – pulling a log, weaving through cones, walking across poles. We might need to do some more of that! The new arena had cows… Sue has yet to decide if he’s scared of them or really, really excited about them. He’s cowhorse-bred, so it’s in his blood to be a little bit of both. One of these days we’ll get out and work with some cows! Here’s to another week of practice before the big show!!! Stop number two on this year’s anniversary trip was New Hampshire. 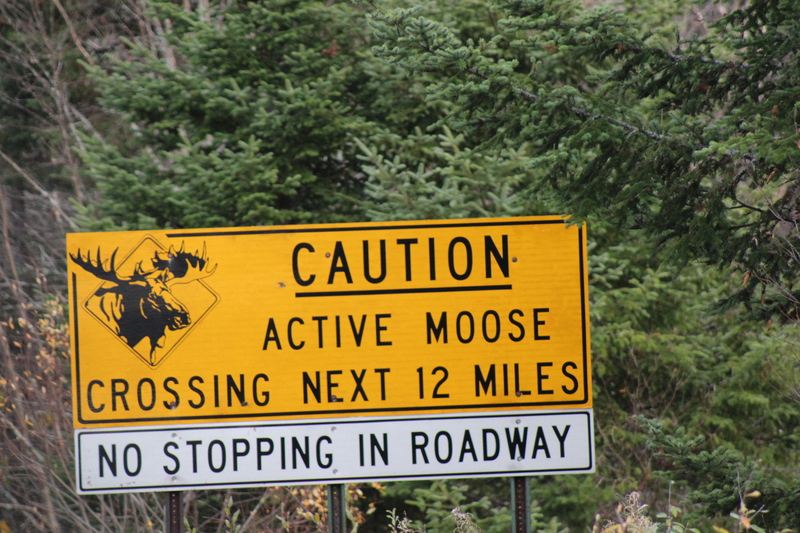 I know, probably not the top of everyone’s list, but I did some Googling and found this cool place called “Moose Alley“. 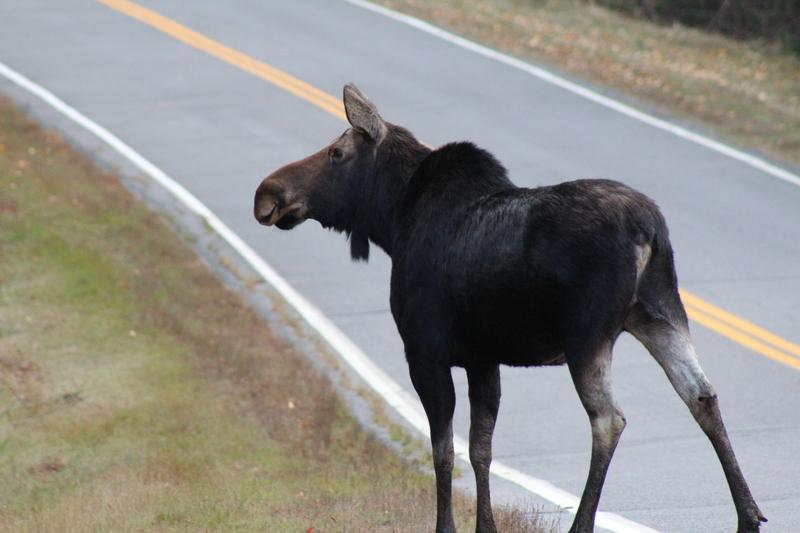 There’s a stretch of Route 3 that runs from New Hampshire into Canada that is famous for it’s moose – they literally wander around on the roads. We pulled into a little store on the side of the road to chat it up with the locals. When I asked where to go to see moose, the shopkeeper very kindly informed me that it was moose season and we wouldn’t be seeing any moose. Now, I don’t know if anyone else’s brain works the way mine does, but that became a challenge for me to actually find one. We cruised up and down the highway a little more and then headed in to find a place to stay for the night. We stumbled across this great little resort called Ramblewood. 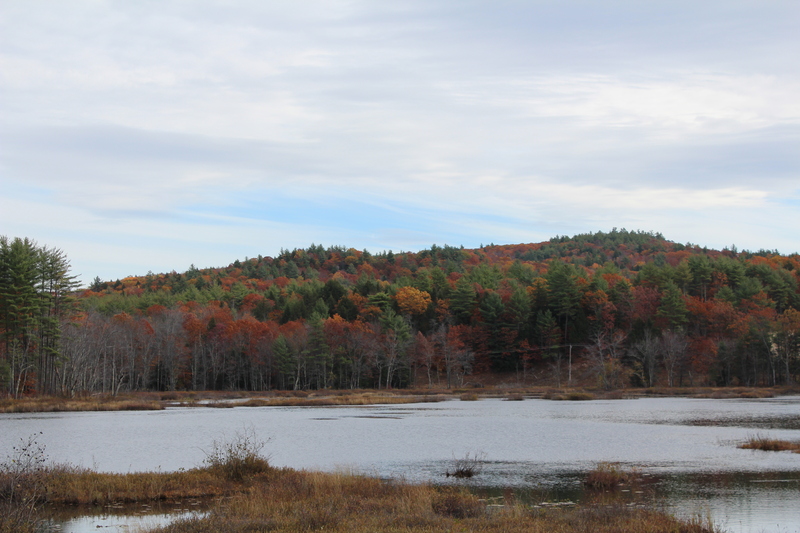 They’re a combination of cabins and campgrounds located right on First Connecticut Lake. 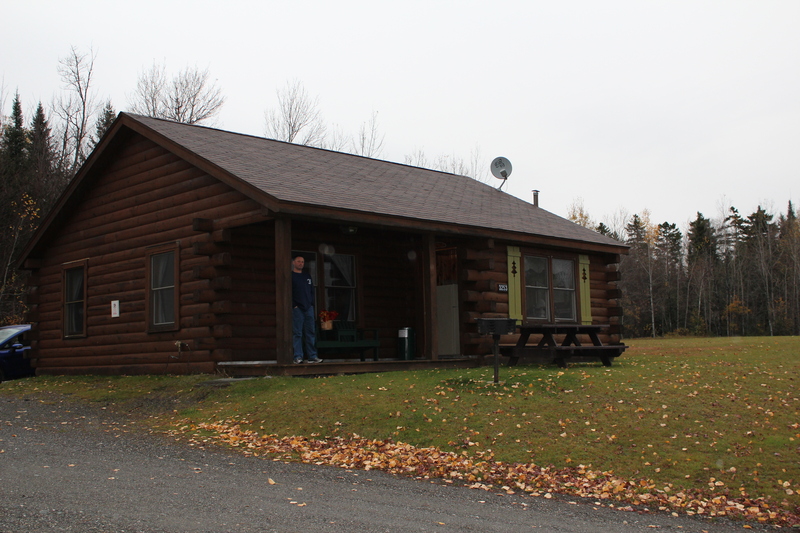 We spent the night in a three bedroom cabin overlooking the lake for a whopping $80. We also saw a pair of moose walking together, but by that point it was getting a little dark and my photography skills were not up to par. I could not believe how big they are… they’re the size of my horse! Unfortunately, we didn’t see any males (would have been neat to see the antlers!) but I was super excited to see these ones! 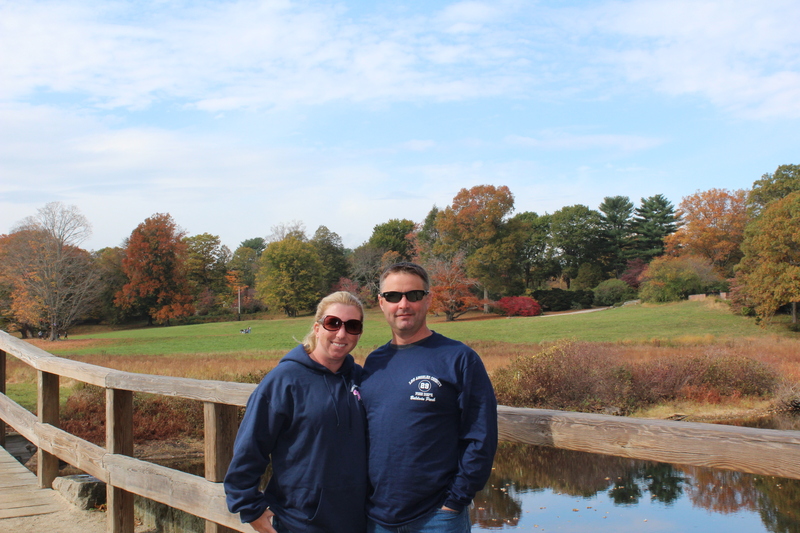 New Hampshire was beautiful… we were about a week or two late for the fall colors, but still got to see beautiful scenery! Well, it’s been over a month since I last posted… things have definitely been busy! Last week Mike and I celebrated our third wedding anniversary. When we got married we decided that we would not get each other gifts for our anniversary, but would instead road trip somewhere together. I love it… since October is our anniversary, it falls just after fire season – a time that I see very little of my husband. It’s always a blast to get away, spend time with each other, and see new places! 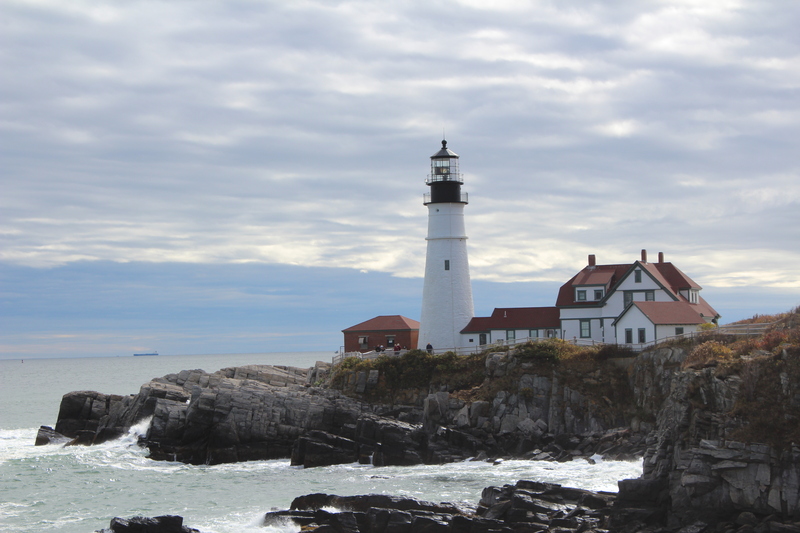 Our first stop in Maine was the Portland Head lighthouse. It was already cold and windy (as was much of the first part of our trip), but it was absolutely beautiful. One thing that I noticed was that the lighthouse itself was not as tall as I had expected. That was pretty much it for Maine. We had beautiful weather and really enjoyed it. Next up… New Hampshire!